Two rabbits, one broken train track. 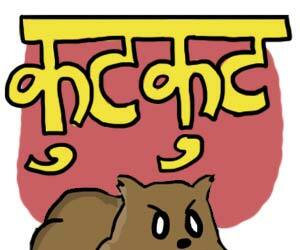 - "Bolne Waale Jaanwar : Cheeku Meeku Ki Kahani"
Cheeku and Meeku was part of a larger comic idea me and Adhiraj worked on – Aaapki Poojita. Concept for an animated TV show that we tried out as a webcomic. It never really picked up in terms of traffic and after turning the script of episode 1 into a comic, over the period of a long painful year (one strip everyday), we stopped. We had many ideas for Bolne Waale Janwar series, so if you like this one, leave a comment, me and Adhiraj will make more happen. To be frank, Chiku-Miku bolne waale jaanwar was the strip that got me hooked to Aaapki Poojita ! correct pointers. that’s sort of what happened. But it was fun to create a universe a comic. And within an year we were able elaborate and create a whole world in a webcomic rather than do the whole one pun a day thing. Anyways, despite the failure, the idea is now real and stays with us.